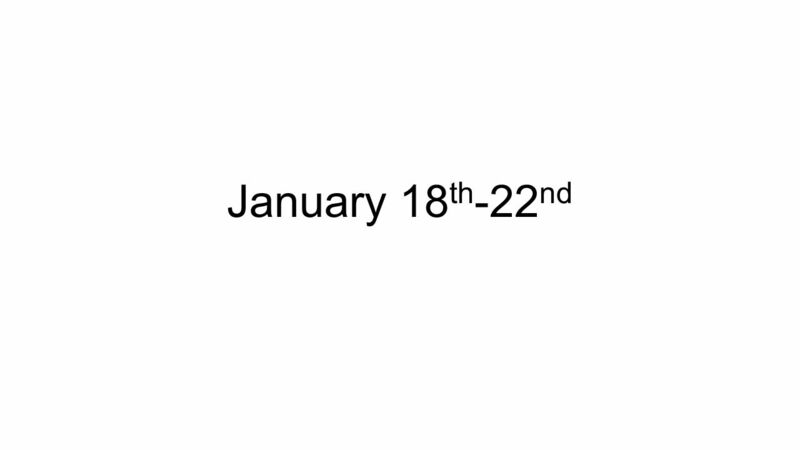 January 18 th -22 nd. German I – Warm-Ups Montag – No Warm-Up Dienstag – No Warm-Up (Vocab Quiz) Mittwoch – No Warm-Up (Chapter 7 Test) Donnerstag – What. 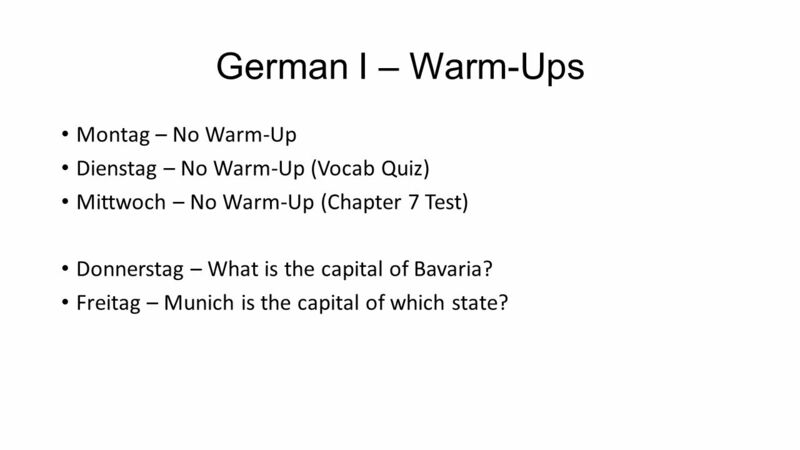 2 German I – Warm-Ups Montag – No Warm-Up Dienstag – No Warm-Up (Vocab Quiz) Mittwoch – No Warm-Up (Chapter 7 Test) Donnerstag – What is the capital of Bavaria? Freitag – Munich is the capital of which state? 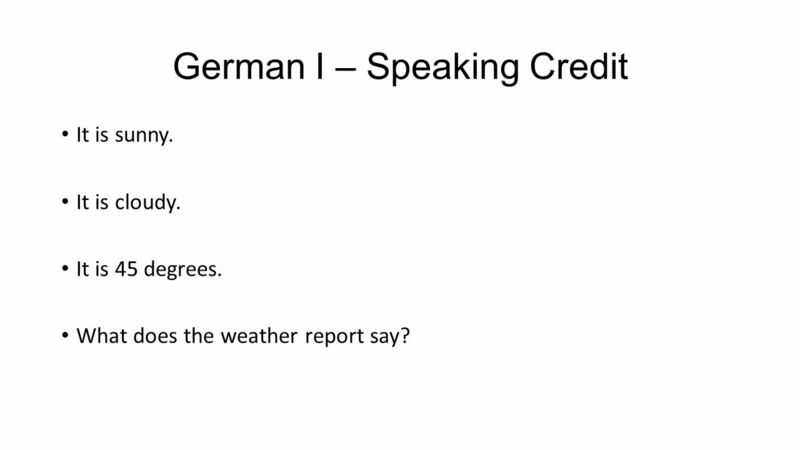 3 German I – Speaking Credit It is sunny. It is cloudy. It is 45 degrees. What does the weather report say? 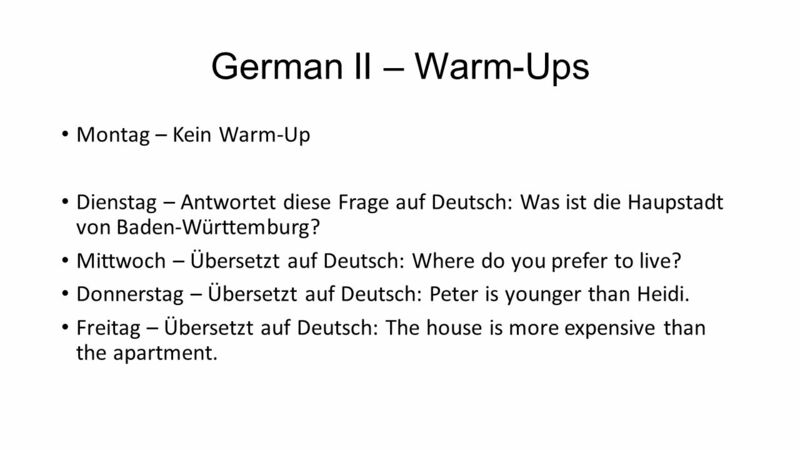 4 German II – Warm-Ups Montag – Kein Warm-Up Dienstag – Antwortet diese Frage auf Deutsch: Was ist die Haupstadt von Baden-Württemburg? Mittwoch – Übersetzt auf Deutsch: Where do you prefer to live? Donnerstag – Übersetzt auf Deutsch: Peter is younger than Heidi. Freitag – Übersetzt auf Deutsch: The house is more expensive than the apartment. 5 German II – Speaking Credit Where do you prefer to live? I would rather live in the city. I would rather live in the country. I would rather live nearby. Herunterladen ppt "January 18 th -22 nd. German I – Warm-Ups Montag – No Warm-Up Dienstag – No Warm-Up (Vocab Quiz) Mittwoch – No Warm-Up (Chapter 7 Test) Donnerstag – What." Starter: You have 5 minutes to design a crazy bike design! ??? Guten Tag! Diens tag den Due: Grammar printout; all old homework Hausaufgabe: Mittwoch den Culture Worksheet Quiz on Thema 4.1 vocab – including.